Back in July of 2016 when my daughter was a mere glimmer in my eye, I read Alex Cooke’s excellent article on shooting drone portraits. I was immediately transfixed by this new (new to me, anyway) concept. Some 12 months after first stumbling upon Alex’s article, I have a seven-week-old at home, and my travel photography has come to a halt (at least for a while). But I can always drone the baby! 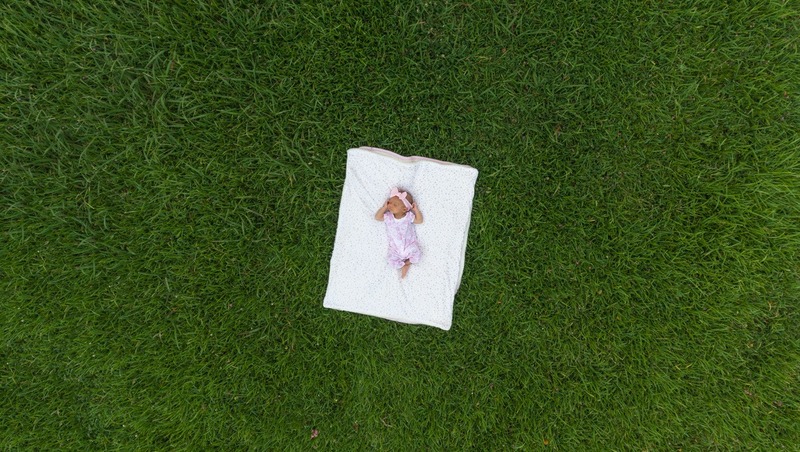 Here are some tips for getting the most out of your newborn drone portrait session.I’ve been an avid droner for a few years now and have worked my way up DJI’s Phantom line to the Phantom 4. I thoroughly enjoy lugging my Phantom around on my travels, and the feeling of seeing the world from above gives me goose bumps every single time I fly. I’ve always captured grand landscape and cityscape scenes but portraits, baby portraits were uncharted territory, and my main concern was safety. A drone (not the Hellfire missile kind, but the more benign photography kind) is a flying camera which is undeniably awesome. In untrained hands, however, it can quickly become a flying death trap. Crashing it into a tree is one thing — crashing it into your baby is another. 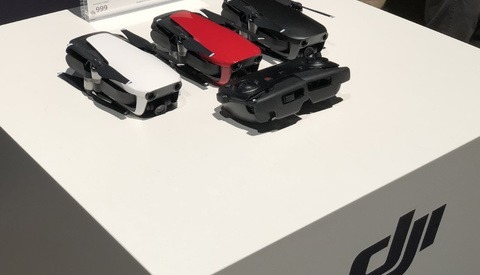 I have years of experience flying the Phantom series without any major issues, so I wasn’t worried about operator error, but you can never fully account for the fact that it could just decide to drop out of the sky at any given moment. We went to a local park twice for shoots. The night before each of them, I made sure that both the drone and controller had updated firmware. Upon startup, I calibrated the compass and made sure there were enough satellites detected (in this case, ten) to get a “Ready to Fly — GPS” notification. I wanted to fly directly over the baby and get an overhead perspective, but I made sure to keep a good distance. Sacrificing some quality by cropping in later in post was a no-brainer. My wife, who of course had full veto power over the whole enterprise, was going to stand right next to the baby the whole time. On the slim chance anything happened, she would be right there for protection. Are you kidding? It’s a baby — forget about trying to pose them! We placed several blankets on the grass for cushioning, waited until she was quiet and calm (asleep is preferred), and just laid her down. She ended up being relaxed the whole time. My theory is that the drone noise was acting like a white noise machine, soothing her. Between that and the slight wind blowing on her from the propellers, she was happy as could be. For landscape and cityscape dronography, I make sure to follow the same general rules as traditional photography, especially in regard to time of day. Sunrise, sunset, golden hour, blue hour — this is when Lucille (what, you guys don’t name your drone?) takes flight. In this case, we planned for mid-morning shoots after a good feeding and around nap time. On both occasions, there were clouds overhead, helping to diffuse the light, so I chose not to mess around with any ND filters. I shot in raw, of course, and put it in Manual, choosing a fast shutter speed to keep my ISO low. With a 1/2.3” sensor, you want to do your best to minimize your ISO value. White balance was Auto. 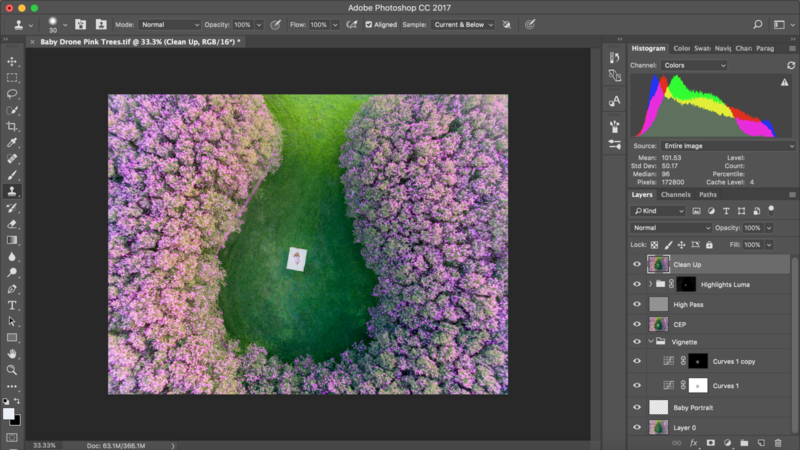 I shot in Auto Exposure Bracketing (AEB) mode just to have the flexibility in post to blend multiple images together if necessary. Since I was pointing straight down at the ground in overcast light, the dynamic range wasn’t actually that wide, and I was able to just use single images in post without blending. I have a couple of spare batteries as flight time is usually limited to around 20 minutes. In this case, it wasn’t necessary as we were all ready to call it a day after just 15. The shoots were both quick and easy. I flew high overhead and, looking through the live view on the app on my phone, methodically worked the drone into the correct position. 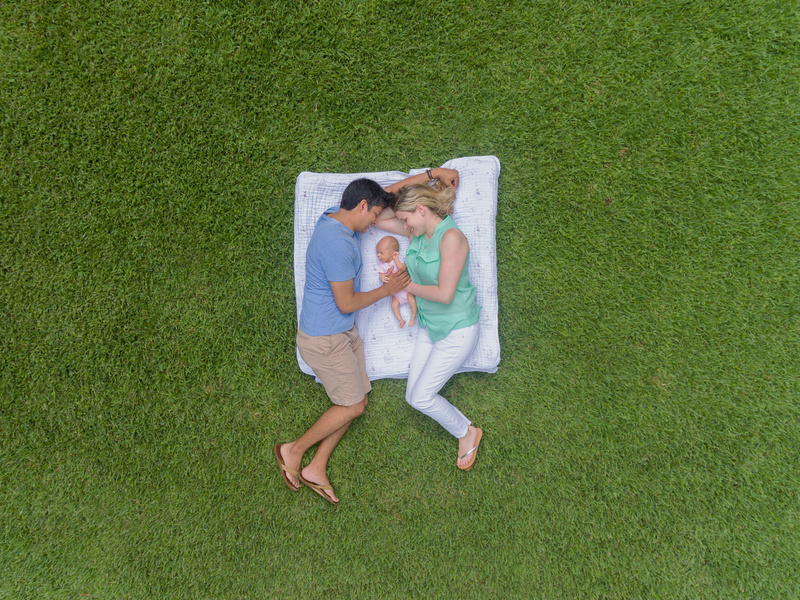 For the main portrait image, I wanted the baby to be perfectly centered with the green grass framing her. After snapping a few frames, I asked my wife to lie down next to our daughter for a few shots. Finally, I decided to jump into the frame as well. This was unplanned but ended up making for a unique and fun family portrait! 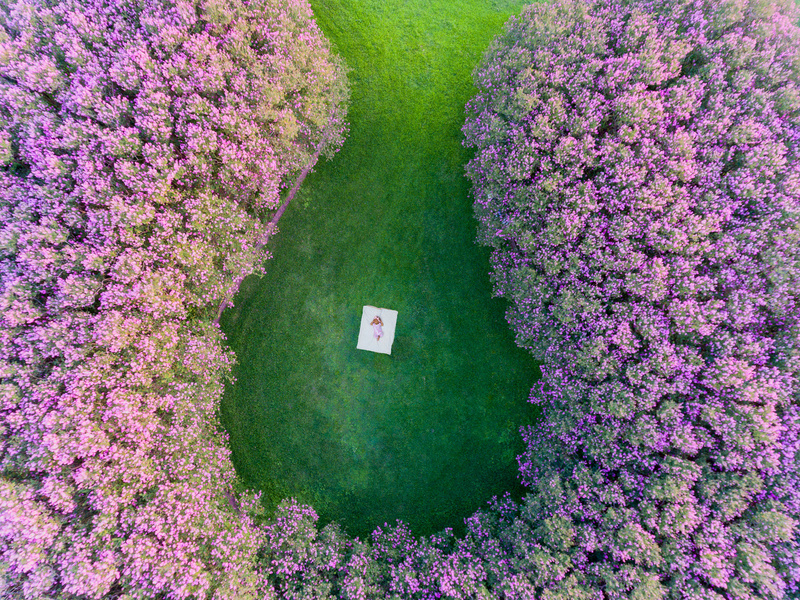 We next moved over to a nearby grove of trees with beautiful pink and magenta flowers. 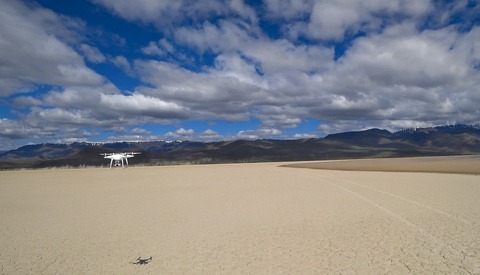 I flew the drone around first, scouting around for a good composition. We angled the blanket and baby (after a costume change into a white and pink onesie with pink bow to match the foliage) toward the opening of the grove, and I filled the rest of the edges of the frame with the colorful trees. Looking at it straight down, it’s not necessarily clear what the viewer is looking at — I liked that abstract element of the shot and thought it better highlighted our girl. That fact was important because, let’s face it: flying high enough to capture the tops of trees meant that the baby was going to be hard if not impossible to see at all (especially given the constraints of the camera sensor). This was a dilemma for me. How do I find the right balance between the two? In the end, I chose to take a closer shot of the baby and blend that into the main overview image. The final picture is clearly not proportional, but in my opinion this was the best compromise when combining the portrait and landscape images together. Post-processing was pretty simple. I brought all the images into Lightroom and did general corrections (white balance, highlights, shadows, distortion). I then took them into Photoshop and did some clone stamping and general clean up, light color correction, selective highlights and shadows correction, and vignetting. 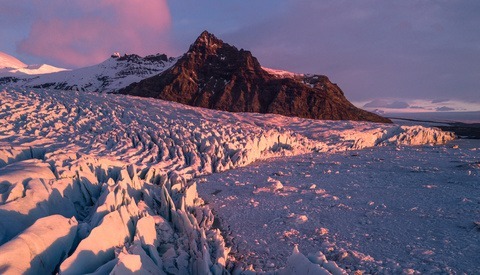 Some selective sharpening and noise reduction rounded out the workflow. 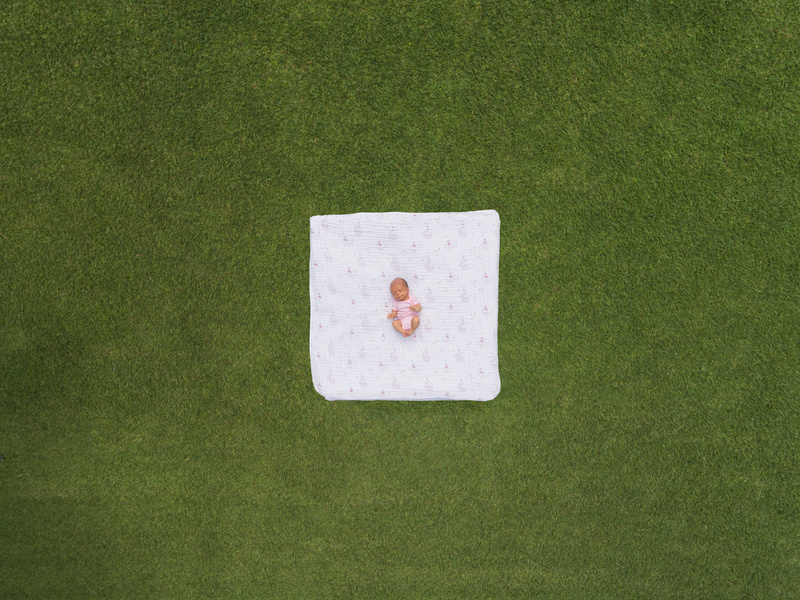 All-in-all, it was a successful first attempt at droning my baby. By professional portrait standards, the images may not be portfolio-worthy, but they are great memories for my family, and that's all I could ask for. If you decide to try this yourself, remember, "Safety first," and after that, just have fun with it. 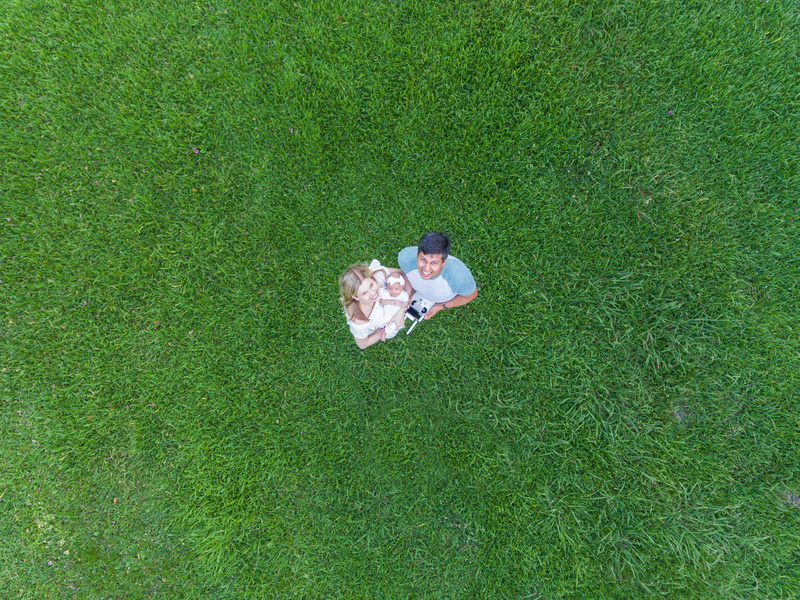 Be warned, your first baby drone session is a gateway drug; I'm already making plans for more elaborate future shoots. Baby on a boat in the middle of a lake — what could go wrong? Thanks, Oliver - much appreciated! Yes! Be safe and post some pics!